The Alhambra Hotel at Maple Tree Square where Carrall and Water Streets meet looks almost identical today to the 1931 photograph on the left. That’s because it’s recently had a comprehensive restoration by Acton Ostry Architects for Salient Developments, who seismically upgraded the building while putting it back to close to original appearance. In the meantime it didn’t look quite as tidy – as this 1968 image shows. The Byrnes Block, as the Alhambra is also known, was built by Victoria based auctioneer George Byrnes, an Australian who had survived a shipwreck coming from Sydney to San Francisco and then not long afterwards become Sherriff in Barkerville. The hotel was one of the first fireproof buildings to be completed after the 1886 fire destroyed the city. It appears that the intial building commission came from Rand Brothers, real estate promoters, who handed the development to George Byrnes while it was under construction. 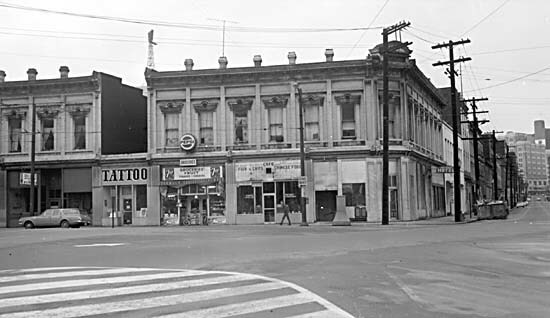 The Alhambra sits on the corner where Jack Deighton rebuilt his saloon, once it bacame apparent that his preferred location and the Canadian Pacific Railway survey were at odds – once they’s established their street pattern his first saloon was sitting in the middle of the street intersection. While other hotels in the area were somewhat basic in their character, the Alhambra was distinctly superior. Each room had a fireplace – as the chimneys still show today. The architect was Elmer Fisher, who moved around from Minneapolis to Denver to Butte, Montana, then completed only two buildings in Vancouver as well as a number on Vancouver Island before heading to Seattle just in time to help rebuild it after the 1889 fire there. His version of his history and documentary records disagree about whether he was Scottish (or more likely American), and he abandoned architecture by the mid 1890s, leaving town after a particularly salacious court case where his former mistress sued him for breach of promise when he got married to a Seattle widow. He won the case, but lost his reputation. We’ve reposted this building because we’ve just spotted a curious change. Back in 2006 Bob_2006, an avid photographer of Vancouver’s heritage buildings, added a picture of the Alhambra as it looked then. At the time it said the building was dated to 1886. As our image shows, that wasn’t true back in 1931, and giving full credit to Acton Ostry and The Salient Group, it isn’t true today. It just goes to show “I read it on a building so it must be true” isn’t necessarily the case.